Yep, we’re introducing the first-ever Copyblogger infographic. It’s about our favorite topic — creating great content. I’m loving infographics at the moment! Will share this on my blog as its fantastic! Good work Mr Clark! I agree. I ghostwrite a LOT of content. This post is a terrific must have for every stuck writer. You forgot cartoon characters, but hey, superheroes will do. This is so cool – Brian, thanks for putting this together, and thanks to the BlueGlass team for making it look so amazing! Definitely a great post to utilize for their first infographic, one of my favorite from you Danny. Great execution from the BlueGlass team too, at first I thought Rafal might have decided to start dominating infographics as well haha! It was our pleasure Danny! Your original article was such a phenomenal resource, so it’s great to expose it to people in a new way. I always refer that post by Danny Iny, but this infographic is much better. I like these ideas! I’ll definitely have to go with them! Hi, this is great, useful ideas and a good reminder to broaden the scope but… novice here, so bear with me! What is the purpose of embedding the infographic on my website? What does it do? Also does it only work with Word Press? Thanks as always for the superb advice, hints and encouragement that Copyblogger provides – it is wonderful for a ‘tenderfoot’! Judith, you would only embed this graphic on your website if you wanted to share it with your audience. Mashable, for example, will often feature infographics created by others, just because they theink they’re cool and relevant to their followers. It works with any blog or website. I love this. I just started writing a blog and I can already feel the pinch of ideas. I saved this in Evernote with my post ideas. Great recycle job. Love it. Question — What plugin are you using to add the embed code at the bottom here? One big problem. Infographics may be cool, but I can tell you from my experience they’re not accessible to the blind or others who use a screen reader. Brian, this is such a great visual list! My post yesterday was all about repurposing content, and this is a FABULOUS example of how that can be done in a really compelling and effective way. I didn’t even mention infographics in my post (should have), but you’ve captured what was already fabulous content, and repurposed it into a great new product. Bravo! I love the graphics on this article. The content is also spot on. I’ve got around 40 posts on my site and sometimes I’m at a complete standstill for ideas on good content. Normally, it hits me when I’m watching tv, listening to music, having a conversation with an old friend I haven’t seen for a while. Great post. This infographic will help lots of bloggers and writers who always struggles lot with coming up a new content topics. So thanks for sharing it Brian And Danny. Perhaps I’m of an age where these kinds of things simply don’t appeal to me–I find my eyes glazing over as they do when I have to look at a Gantt chart or spreadsheet. As a graphic designer I find it too busy, the layout too erratic, the colors uncoordinated. As a writer, I find the message difficult to assimilate. Sorry. Probably not age. It comes down to your preferred learning style. A lot of people in the Copyblogger audience are pure textual readers (as am I). But some people are different, and we’ve been completely neglecting them (which is why we also launched a podcast for auditory learners). Hi Brian and Metafore, this is my field and Brian, your answer is absolutely spot on! Soon you will be challenged to produce blogs for those with Kinaesthetic preferred styles – now there is a challenge for you! Taking a walk works well. Dissolves writer’s block instantly. I prefer writing first thing in the morning. My mind is clear, and I can pen stuff quickly. I also take a break offline around 2 or 3 in the afternoon and churn out 2 more blog posts. I prefer being offline; no distractions. What works for you, works best. Experiment a lot if you feel writer’s block is too prevalent. Really, if you are staying on topic and listening to your audience, including EVERY interaction you have with a reader, prospect, or friend in your niche, you never run out of ideas. Ever. Each conversation contains 1 to 5 post ideas. Hands down. As you become more adept at listening, you never lack for ideas. This infographic is informative, practical and will help bloggers from every niche to improve. It’s like a cartoon cheatsheet for beating writer’s block. I think I can sense a trend about to explode. Am I the only one that had to do major work to the embed code for it to display? The code was completely messed up. Worked fine when we tested it, and from the trackbacks I’ve seen, lots of people had no problem quickly resposting the graphic. Not sure why your experience was different, sorry. URG… it cleaned it up… There were even more tags. Sorry about that, Aweber often does frightening things to code. So far the folks who have clicked through & copied from the post are fine … as you can see if you click through, it’s pretty straightforward, there’s not much there to go wrong. Exactly. I wasn’t complaining , but just letting you know. This is a great resource. Thanks for sharing! If you use WordPress, make sure you paste it under the “HTML” tab. I understand that, but the tags were all incorrectly nested. The HTML snippet in the post above is the snippet I ended up with after I took about 75% of the email’s code out. Oh, you pulled it from the email? Yeah, I bet something happened in Aweber to corrupt the code. I always click over to the site for the embed code, where we know it’s correct. Just wanted to thank you for the super infographic and the opportunity to share it with my readers. I’ll be linking Danny Iny’s great article too. I know I’ll be looking to it often on those days when writer’s block sets in. What? Copyblogger is now using infographics? Actually, I needed this today as I have about 20 incomplete posts, but this gave me a few new ideas, so I’m off. This is terrific, one of my tricks is to stop thinking about the article and start writing unrelated quotes sometimes 10 – 15 – 20 and amazingly enough the mind calms down and somewhere in the middle you start picking up threads. Loving this. It’s an entertaining piece of work. But most importantly, its super useful. I’ve bookmarked this page and before I begin my daily writing session I’m going to review it. It’s an excellent way to draw some ideas. Very cool. Writers block can hit all of us from time to time.These are good points of reference and I like the mashing of subjects combined with incorporating a trending keyword if possible. I’d love to have a poster for my office wall. The infographic is a great source of inspiration. Awesome work as per usual there. You and Blueglass outdid yourselves. Truly an inspiring article. However, I am having difficulties finding article ideas to match my product niches. Any suggestions? You need to study your prospective readers for that. What are their problems? What do they desire? What’s related to your topic that’s also interesting to them? Only your audience (or the audience you plan to reach) can reveal these things to you. It’s an amazing way to teach something that is pretty interesting for most of us. Hooray for infographics. Good job folks, more please. Awesome Post! And good ideas. I regularly take days off from writing to rest and go to shows to keep my creative powers sharp. I would enjoy seeing more infographics from Copyblogger. Sweet infographic. I love words like you guys do, but the illustration is a fresh approach to a topic I’m sure you guys have covered dozens of times. Wow, those graphics are excellent, and ties in perfectly with #22. At the moment I’m following the 52 headline hacks from Jon Morrow, and it was whilst watching the muppets that I got the idea that build perfectly upon the headline which was about using a famous brand. Couple great headlines with these ideas and you should have no excuse to come up with a quality blog post. Excellent infographic Brian but more than the infographic itself the little “pin it” share button caught my attention more than anything:) I don’t normally struggle with coming up with ideas for content but would definitely love to add infographics to my arsenal of content creation. I loved this graphic!! And I’m going to break it up a bit by taking my son to the circus!! Thanks for sharing your brilliance! Some solid ideas in there. I love a blog that shares both their successes and their failures. It helps give a more rounded picture of an individual or business. If you’re just hearing about their success, they might seem too good to be true. Great infographic! Highlighting each of these areas for content ideas is great. Over on the Vertical Measures blog we certainly have tried our hand at just about every one of the ideas you list in your Infographic. Finding the right topic and type of content for your audience is extremely important to your overall success. These ideas are great and getting them into the right hands of the people who can execute them best is the next step. Recycle is the best one. Most ideas these days are just recycled from something someone has read from somewhere. Regardless, nice info graphic Danny. How long does one of these things take and how much does it cost? Really beautiful. I wish I could add something new to what everyone else has said about how AMAZING this post was. I am totally digging the infographic and as I’m also new(ish) to blogging professionally, HOW DO I MAKE ONE? Is there a software that I can buy/download to make them myself or do I always have to hire out? I love these ideas so much – I think I’m going to try one for the next 22 days. This is so great! Can only support all the posts that have expressed this in so many ways! Thank you very much for giving us all those great ideas in such an original way! Loving the fact that the posting of your content from my side of the pond shows two of my sites in the Top 10 results on Google for the search term; “22 Ways to Create Compelling Content”. One of them right below Copyblogger. Must be because Genesis rocks. I have become one of ‘those’ people who refer others to you just because you rock and not because I can get an affiliate commission. Keep up the good work. The best method I’ve used is brainstorming and asking my readers what they like the read. Heck, since all my readers are mostly my friends and family, it’s quite easy to ask them for their opinion and what type of post they would like to see. As for interviewing somebody, I’ve find that part really difficult. Either because i have trouble coming up with questions to ask, or because i really don’t entirely know them that well to ask good questions. Thanks for sharing the awesome infographics. I’d love to use it on my blog as it provides useful advice for bloggers. Love this, BUT please don’t use the word “Case Study” for what is a review. A case study is a behind-the-scenes story about what a company or brand tried to do and what the results were of their efforts. Your opinion, no matter how expert, is not a real-world result. It’s just your opinion. And as we all know from A/B testing, many, many times experts opinions are proven wrong when you look at the results data. Seriously, I fall in love with this infographic. Can I add one more? List posting perhaps? I absolutely loved this post- very informative and the graphic are great. I’m pretty new to the world of copy-writing, and I sometimes find myself worrying sick if I’m doing it right- this is going to be my new go-to tip list. Thanks so much! Looks fantastic! Thanks for putting this together. Good good infograhics. Excellent writer’s block hack. Jon, are you reading this? Thanks for that headline hack report, you so, so rock. Thanks for putting this together because believe me its be pretty hard to come up with ideas when you’re writing about main street financial stuff. Not so sure about #19. Awesome, awesome stuff. Thanks for putting the time into this kind of fun information. That is a great info graphic! I will be reposting with your code on my blog, thank you so much, this will definitely help my readers and subscribers! Thank you for the great Infografik. I’ll send you many greetings from Germany. Loved this graphic. I’ve been thinking about doing some of these. Now I’m sure I will. I re-posted this on my blog. Excellent suggestions and graphic, thanks very much. I love infographics and this one is superb! And so much fun, to boot. Thank you for sharing the html so we can scoop it up. I second the comment suggesting a poster – I’d put one on my office wall in a second. great suggestions with awesome graphic..! i’m gonna print this one…. Another great info graphic that that I’ve seen today! They seem to be trending recently! I love reading them, very entertaining and informative! This is extremely nice! Thank you for all the ideas. I love taking a walk, window shopping to generate ideas! Great post it is amazing how a great graphic can create a nice visual post with content, without having to write too much content! I love this post and have tweeted and liked it! This post not only shares the great tips but also demonstrates how to recycle existing content in a different media format. Sometimes it’s not that I don’t have a clue about what to write, but I always feel like every idea, on anything, has already been written on. Your post has inspired me to use tip #1 content curation to compile some of my favorite blog posts. Thank you for showing us how to repurpose a great content and the outstanding Infographic! Excellent work. I have pinned the infographics on my pinterest. Thanks for this. This is terrific! I’m sharing on my blog. Thanks so much. Brilliant. Just adding my “thanks” to the long list! Always great to have a fresh and awesome graphic to get you out of a rut! Thanks for this great graphic! I am putting it in my blog for sure. Love it! Great tips! Thank you. This is great! In today’s infographics “craze”, you seldom see as many actionable items as this one has. Very good job. The ideas are excellent, and you can use them right away. Definitive a great source for start to writte. If you dont have idea where to start, read this pick a topic and start. I just pinned in our “We Love Infographics” board: http://pinterest.com/aboutusdotcom/. Thanks for the great infographic. We love your blog! Forums are also a great way to get more info on a certain topic that you don’t know. Getting key ideas or main points that are being stressed out on forums could help you to get going on a topic that’s totally out of your field. Wonderful resource for all creative endeavors. Can’t wait to start implementing these ideas. I’ll be sharing it too. First infographic ever? You could never tell! I found the info quite useful and I thank you for that. So adorable, yet so powerful – like a miniature doberman pinscher! I’m re-posting on my site and printing it for reference. It’s part of my efforts in being green – reduce, reuse and recycle! A good post at the right time, i do have some incomplete posts. So i got some good ideas here to recycle them in a better manner. I wonder this is how the great bloggers have came about. This has to be one of the best infographics I’ve seen. I think everyone gets to this point at some stage and it can be difficult to reboot. Or, at least it was… but now when you get have way though the 22 points the ideas start to flow. One for the wall! Thanks for this – good ideas for me, and great content for my blog! Infographics are so much more appealing than a written list, which in itself helps to get the creative process started. The hardest thing for me in maintain a blog is adding quality content, you gave me some great ideas about how to go about finding new ideas, Thank you. Awesome infographic. I always have a hard time coming up with original content, so this really helps. This is one of the best tips I’ve seen whenever you encounter a writer’s block. Great ways to come up with ideas on how to get started writing. Great post, will help me a lot with my content strategies moving forward. Cheers! Thanks Brian for that awesome poster. Totally loved a lot. I actually always use other news articles as the reference to write new post on my blog. I also like to use new products of companies in my niche and make reviews of them. And every time my head is stuck and i just cannot write anything (even when i’m begging), i usually go somewhere else outside the house and just think of new ideas for my new posts. Anyway, just saved your poster. I wish i had a printer to print this poster and put it on the wall of my room. LOL!! 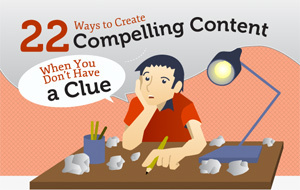 Hi Brian, Thanks for the fantastic infographic – a very useful aid for content writers! Awesome post and infographic! Got a lot of ideas out of it.